In medium bowl, place Bisquick™ mix. In another bowl or measuring cup, beat eggs and milk using whisk. Pour into bowl of Bisquick, and mix well. Place about one-third of the batter into another bowl, and using a toothpick, add a few tiny drops of green gel colour; mix well. To remaining batter, add a few tiny drops of pink gel colour; mix well. Spoon the batters into 2 separate squeeze bottles, which makes it easier to create watermelon shape. Heat 10-inch or larger nonstick skillet or griddle to medium heat (325°F); grease lightly, and pipe (or spoon) the pink batter into rounds. Outline the pink batter with a small strip of green batter. 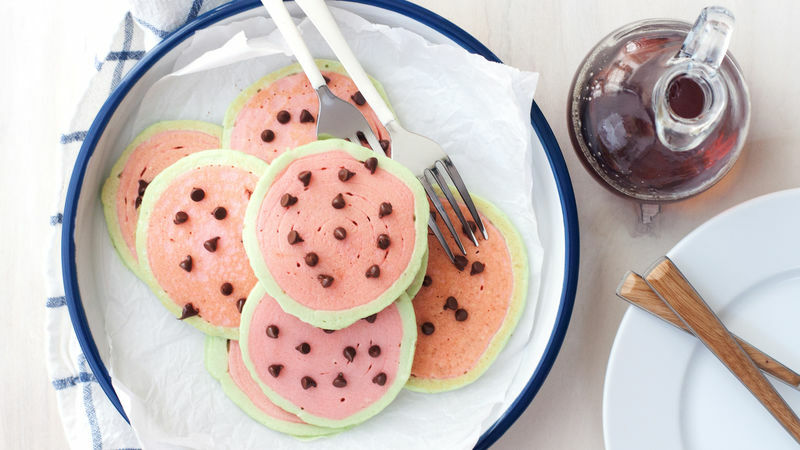 Sprinkle chocolate chips onto the pink sections, and cook until bubbles begin to form around edges of pancakes; turn. Cook other side until slightly golden and edges are dry. Transfer to plate, and sprinkle with additional chocolate chips, if you like. Spooning the batters into squeeze bottles make it super easy to create the watermelon shape. Squeeze bottles are easy to find at any bulk food store or craft store in the confectionary (candy!) supplies section. Since the squeeze bottles make such easy work of creating the pancake shapes, switch it up with watermelon wedges or even half moons! Keep the pancakes warm by placing them in a preheated 200°F oven.